brauch accepted D19764: Fix Minimap with QtCurve style. Looks sensible, and I think I've even seen this bug already somewhere. brauch added a comment to D19621: ViewPrivate: Make deselection by arrow keys more handy. Hm, so shift-selecting with Shift+Left 5 times, then pressing Shift+Right once clears the selection? Just for the statistics, deselecting one character is a feature I use all the time. brauch added a comment to D19457: Resurrect kdev-java. brauch accepted D19457: Resurrect kdev-java. brauch added a comment to D18551: clang: Create preamble only on second parse. brauch added a comment to D17971: Revive External Tools plugin. Something which would be quite powerful too would be to execute a tool on saving a file. This would e.g. allow integrating formatting tools such as golang's very easily. brauch added a reviewer for D18122: Fix Xdebug disconnecting after php finished if multiple connections are allowed: pprkut. brauch updated subscribers of D18122: Fix Xdebug disconnecting after php finished if multiple connections are allowed. brauch added a comment to D17915: Clang CodeCompletion: No auto-completion for numbers. brauch added a comment to D17582: Some tweaks to the appimage. Looks ok to me! Maybe put it into master? brauch added a comment to D17459: SearchBar: Add Cancel button to stop long running tasks. brauch committed R877:f00f3842a387: kdevelop: add 5.3.1 tarballs, set 5.3.1 as default target (authored by brauch). brauch committed R52:bd2f80843326: Version 5.3.1 (authored by brauch). brauch committed R53:a58639ee0655: Version 5.3.1 (authored by brauch). brauch committed R32:759642f7ea46: Version 5.3.1 (authored by brauch). brauch added a comment to D17255: KDevelop: support for installing into a non-standard parallel prefix. brauch added a comment to D17241: WIP:Disable highlighting after 512 characters on a line..
brauch added a comment to D17145: Don't reverse order of files opened from the command line. brauch added a comment to D17131: Fix problem model test on Windows. Make sure that when we create a path the root of that path is created according to what is expected on the current platform. E.g. C: on Windows.. Since it only touches a test, I don't see any issues with putting it into 5.3. Thanks! brauch accepted D17131: Fix problem model test on Windows. Make sure that when we create a path the root of that path is created according to what is expected on the current platform. E.g. C: on Windows..
brauch committed R53:6bf5c812a8bf: builtin docs: remove file and execfile, they are not in python 3 (authored by brauch). brauch accepted D16942: CMakeCacheModel: avoid string memory duplication. brauch requested changes to D12746: KDevelop: alternative monolithic storage options for TopDUContexts (PoC). brauch added a comment to D16668: Remove document preview plugin: current technology harms workflow. brauch added inline comments to D16484: Add scratchpad plugin. brauch committed R877:9d47038339df: set default target to 5.3 branch for KDevelop (authored by brauch). brauch added a comment to D16484: Add scratchpad plugin. brauch added a comment to D15976: Fix KDevelop's detection for Visual Studio 2017 compiler and tools..
brauch committed R52:177f473da1cd: Set version number to 5.3.0 (authored by brauch). brauch committed R53:05fbc4ee57eb: Set version number to 5.3.0 (authored by brauch). brauch committed R32:306a2a04a89b: Set version number to 5.3.0 (authored by brauch). brauch accepted D16386: Place cursor after opening brace for function implementation. brauch added a comment to D16386: Place cursor after opening brace for function implementation. Is the opening brace always on its own line, independent of the formatter selected? brauch added a comment to D16315: Offer completion after user types the scope resolution operator..
brauch added a comment to D16064: Fix memleaks in unittests. brauch added a comment to D16203: Context browser: fix handleRect for non-symbol tooltips. brauch added a comment to D16218: [KDevelop/Core]: safe signal-handler implementation. 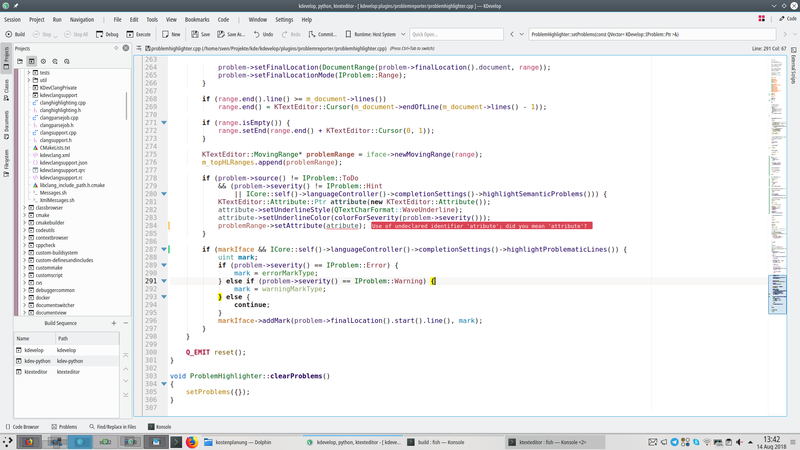 If there is no solution which does not require two different code paths for handling this problem, I'm against merging this, non-conformant old behaviour or not, sorry. brauch accepted D16123: windows: Detect VS2017 compiler and tools. brauch added a comment to D15804: Fix Duplicates on Quick Open File. Code-wise this looks fine to me otherwise. I can try it out. brauch accepted D16085: Improve support for 'with' statements..
brauch accepted D15955: clang: Also detect Clang builtin dirs at runtime. brauch added a comment to D15895: Use CLANG_INCLUDE_DIRS for clang include dir. On Arch Linux, the latest version of the patch seems to work fine. brauch committed R877:b0d4b8eced7d: unbreak kdevelop blueprint (stable -> unstable in URL scheme) (authored by brauch). brauch committed R877:347930b1086d: KDevelop: build 5.3 beta tarballs (authored by brauch). brauch committed R32:997be66c7fc6: appimage: fix clang plugin from not loading (authored by brauch). brauch accepted D14818: Fix ClassNameReferences.. I'm not really capable of doing an in-depth review here, since I don't know enough details of PHP nowadays. Style-wise I think it could still profit from reducing the block size of un-named (i.e. not a function with a name), uncommented complex code a bit, since it often requires quite some thinking to grasp what a certain conditional actually checks for. A simple comment like "// not a function" or whatever can do wonders there. Feel free to merge this as-is or with a bit more comments, better get it in before the beta and still have a fix window before the release than merge it after the beta. Thanks for keeping kdev-php alive! brauch added a comment to D14865: clang: include tooltips: fix range check. brauch added a comment to D7010: KSqueezedTextLabel: call updateGeometry() when text changes. brauch committed R499:08c8604fc862: Set stable branch of KDevelop + plugins to 5.3 (authored by brauch). brauch committed R32:c0e3d5248aa6: Add ExplicitlyTyped flag to Declaration. (authored by michalsrb). brauch closed D14838: Add ExplicitlyTyped flag to Declaration..
brauch committed R877:45127004671e: set version to 5.2.4 for KDevelop (authored by brauch). brauch committed R53:0a886a8b0c4e: Set version number to 5.2.4 (authored by brauch). brauch committed R52:5f9eed585d69: Set version number to 5.2.4 (authored by brauch). brauch committed R32:9a09ad18da80: Set version number to 5.2.4 (authored by brauch). brauch added a comment to D14897: InlineNote: Pimpl inline note data without allocs. brauch added a comment to D14818: Fix ClassNameReferences..
Good amount of tests :) For the actual implementation, I would suggest trying to make it a bit more readable by a) splitting it up into several functions and b) trying to reduce indent depth a bit by using continue instead of nested ifs. brauch accepted D14876: Improved type detection for object properties..
brauch accepted D14839: Improve resolution of namespaced identifiers..
brauch added a comment to D14894: [RFC] Fix block mode for multi-cursor branch. brauch committed R39:a534a608fa67: fix build: link against KF5::SyntaxHighlighting where needed (authored by brauch). brauch committed R39:4ea5fee0afe5: Add inline note interface (authored by brauch). brauch closed D14826: inline note interface wip #2.
brauch updated the diff for D14826: inline note interface wip #2.
brauch added a comment to D14879: Fix VariableToolTip auto resizing..
Just let us know at any time if you want that. brauch committed R32:6b146066a491: Fix VariableToolTip auto resizing. (authored by michalsrb). brauch closed D14879: Fix VariableToolTip auto resizing..
brauch added a comment to D14870: Inject environment profile variables into debug process environment..
brauch committed R53:6b7846263088: Inject environment profile variables into debug process environment. (authored by Kebianizao). brauch closed D14870: Inject environment profile variables into debug process environment.. I will submit this for you later. brauch accepted D14870: Inject environment profile variables into debug process environment.. This change looks very reasonable to me. Thank you! brauch added a comment to D14710: Inject default environment group variables into debug process environment..
brauch committed R52:97235b1455c6: Merge branch 'master' into 5.3 (authored by brauch). brauch requested review of D14865: clang: include tooltips: fix range check. Restricted Application added a project to D5802: ViewPrivate, KateSearchBar, KateVi::MatchHighlighter: use selection foreground for search highlights: Kate. brauch committed R52:d4f4291bdf92: Merge branch 'master' into 5.3 (authored by brauch). brauch committed R52:38d2dbfaee7e: Set version to 5.2.80 (authored by brauch). brauch committed R32:aa167a2de736: Set version number to 5.2.80 (authored by brauch). brauch accepted D14840: Fix last > rowCount() assert in ClassModel Node dtor. brauch accepted D14838: Add ExplicitlyTyped flag to Declaration..
brauch added a comment to D14826: inline note interface wip #2. Thanks for the feedback! I will try doing a few more things with this interace and then maybe discuss again with the other kate people here at Akademy about which one they like better. brauch reassigned T3662: Multi-Cursor: block selection mode is broken from brauch to lepagevalleeemmanuel. brauch updated the summary of D14826: inline note interface wip #2.
brauch added reviewers for D14826: inline note interface wip #2: michalsrb, dhaumann, cullmann.